A First Timer's Visit to The Masters — PJKoenig Golf Photography PJKoenig Golf Photography - Golf Photos For Those Who Love The Game. When I was 12 years old I watched my first Masters on television. At the time, I had barely picked up a golf club and I figured that courses like Augusta National were something that I was only allowed to see on television. That all changed when I was the lucky winner of 2 Saturday tickets in the Masters "lottery" for the 2016 Masters. I decided to bring my friend John, he was ecstatic and so was I. The plan was to golf, watch golf, golf some more, and then watch some more golf. Sleep was not figured into the agenda. The 2016 Masters agenda started off on Friday with a 36 hole golf fest at Reynold's Plantation located in nearby Greensboro, GA. My golf buddy John and I got up early to play the Great Waters and The Landing courses. We took great pleasure in knowing that just down the road, the world's best were playing in the same windy conditions that we endured. After wrapping up 36, we hurried off to bed like a couple of kids on Christmas eve. In the morning we would be headed to The Masters for the first time. Having obsessively watched and read about The Masters tournament and Augusta National over the years, I felt that I had a pretty good idea of what to expect and just as I expected, my expectations would be exceeded. Parking at The Masters is free as the lot is actually owned by Augusta National. We were able to find a parking spot with relative ease. We popped a quick selfie to document that we actually made it to The National, (that's what the locals call it), and since no phones are allowed inside, we left our gadgets behind and headed into the gates. The only photo taken on Augusta property captures the excitement. Holderness and Bourne polo ensures that I am looking sharp! There had been discussions as if I would actually weep when I first laid my eyes upon the grounds of Augusta. Fortunately, I was able to hold it together. We had conveniently arrived 7 hours before the leaders (Rory McIlroy and Jordan Spieth) would tee off. This provided us just the right amount of time to walk the back nine and play some virtual golf, we used our imaginations instead of our golf clubs. After taking a quick glimpse of 18 green and muttering a few dumbfounded phrases, we headed down #10 to hit our imaginary tee shots. Augusta National is much larger and more spacious than it appears on television. Everything will make sense once you see it. The television coverage does not adequately capture the scale of the elevation changes and slopes. Amen Corner is just as glorious as I had pictured it in my dreams. Scoreboards are everywhere and actually add a great deal of atmosphere to the course. The place smells different. A mixture of pine, bbq sandwiches and freshly cut grass. Somebody should make an "Augusta" pine tree air freshener. People are super nice and extra polite at The Masters. Just being at Augusta National brings out the best in everyone. The tees and greens are much closer to each other than I had imagined. The Mackenzie architecture is very enjoyable. Since the course was configured with the patrons in mind, there are many great places to watch live golf. One of my favorite policies at Augusta National is in regards to the seating. If you decide to bring your own chair, you can place it wherever you would like on the property and then carry on exploring the rest of the golf course. When you come back, your chair will be waiting for you. Someone may be sitting in it, but just let them know that this is your seat and they will gladly pop up in an instant and thank you for your kind and sharing spirit. Again, people are super nice and extra polite at The Masters. After carding a virtual 41 and 39 on the back nine (I holed out for bogey on 15). It was time to watch the pros play actual golf. 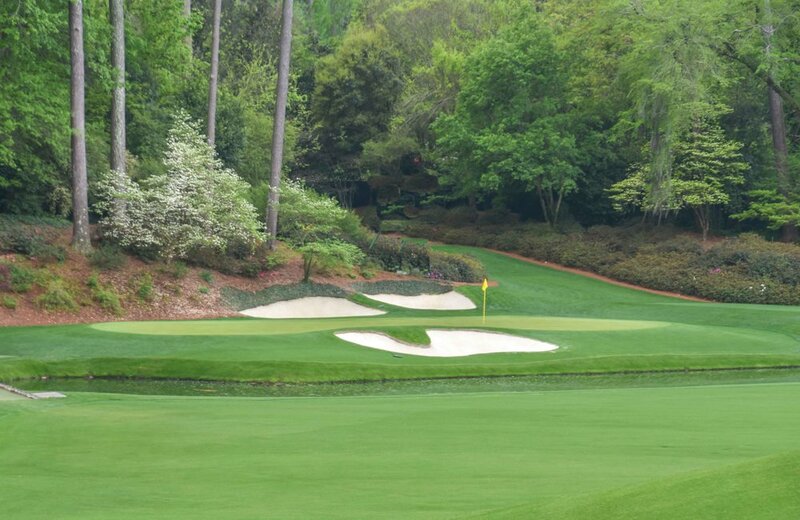 While there are many great spots to take in the action at Augusta National, here are some of my favorite spots on the property. Hole #6: As is the case with most holes, you can get right next to the players as they hit their tee shots into the drastically downhill par 3. We watched Hunter Mahan come 1 foot from making an ace. We groaned. Hole #16: We snatched up a couple of chairs on the hillside. From this vantage point you can watch all of the action on the par 3 as well as the play on 15 green. We saw some birdies and a couple of "other" scores. One of the best vantage points in all of golf. Amen Corner: From the unique arrangement, you can watch the action on 11, 12, and 13 all from one spot. I knew this coming in but was surprised to find it actually was all "right in front of you." Golf Digest's Ashley Mayo informs me that there is an area behind 12 green where there are no cameras or microphones. Players take this opportunity to vocalize their frustrations. #2 green: You are right in the middle of the front nine and will get to watch a fair number of eagle putts. While I was most excited to watch the golf and see the course, I was also looking forward to getting my hands on the reasonably priced concessions. Here are your Selections at The Masters. Masters BBQ Sandwich: Classic deliciousness, will repeat. Consumption total: 1. Masters Pimento Cheese: After much hoopla, this crowd favorite let me down. Masters Cookies: I went with the chocolate chip and oatmeal raisin. I love cookies. Masters Georgia Peach: Peach yogurt in between sugar cookies. A slice of golf heaven and your Selections at The Masters champion. We convinced Ashley Mayo that Shaquille O Neal just walked by her at Amen Corner. Plots to break into the exclusive Berkman's Place were conceived. We pinpointed it's location on the map but no action was taken. When Jordan Spieth hit his drive right on #17. We capitalized by making our first Master's television appearance. That was me in the yellow pants. We estimated that we'd probably hit #12 green only once out of every 6 attempts. We annointed Rory McIlroy the winner of the "Tighest golf shirt" contest. We exceeded our golf shop budget. Not only do I recommend establishing a healthy budget, I also recommend exceeding that budget. Coffee mugs and hats for everyone! We drank from the fountain on 17 in hopes that the mystical water would lower our handicaps. The bathroom attendant informed me that "A stall does it all" as he rapidly ushered patrons through the men's restroom. Lee Wybranski makes some mighty fine posters. Plenty of great options in the golf shop. Get a head start on 2016 Xmas shopping. After spending approximately 12 hours on the grounds at Augusta National, we were ushered off of the property and left the course changed men. This was easily one of the most enjoyable days of my golfing life. A big thanks to every one who played a part in my 1st day at The Masters. On Masters Sunday, I like to golf in the AM and Masters watch in the PM. We teed off at the somewhat nearby Sea Island Golf Club and headed to a local restaurant to watch the conclusion of the Masters. Golf fans will know what happened next as we tuned in to CBS. As a Jordan Spieth fan, I was shocked to watch the events that unfolded. However, I was inspired to see how Jordan reacted and I look forward to his response over the long term. As golfers and humans, we can all learn a lot by watching this 22 year old. We also learned quite a bit about the 2016 Masters champion, Danny Willett. With an outstanding final round, Willett won the Masters just as much as Spieth gave it away. I will look forward to returning to Augusta and The Masters. Perhaps a practice round, where I can take pictures! UPDATE: I made a return visit to Augusta National during a practice round in 2017. Even though we only had a few brief moments in between the rain, I was able to snap the pictures you see throughout this post.